Oregano is very popular in Italian and American kitchens. Oregano is also prominent in French cuisine where it's an essential ingredient in the blends fines herbs and herbs de Provence. Suggested Uses: You'll also find it in recipes from the Mediterranean (like pesto, which highlights the spice), Thailand, Vietnam, China, and Taiwan. 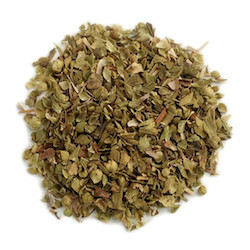 Oregano is a customary seasoning in tomato-based sauces, juices, and dressings. It blends well with basil for pizza sauce and with other seasonings, especially lemon, garlic and thyme.